Inverness Sheds offers a large display of Superior Sheds as well as Carports and Steel Buildings. 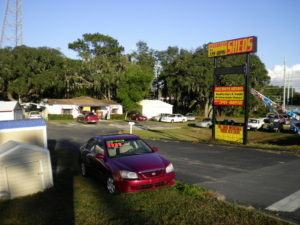 Plus if you are looking for a car – check out their inventory! Joanie & Bob love the Inverness area and their customers. Now the next generation of the family has come into the business – stop in and meet “Donna & Ted”. Inverness Sheds continues their strong commitment to customer service and offers FAST DELIVERY! They also offer Financing and a Rent To Own plan – an affordable payment for any budget. Another truly Local Business. Come in and say “hello” – see the variety of sheds – including the large 14′ wide units. Many Stock Sheds and they can easily custom order one!! *Shed sales and delivery servicing Citrus County, Inverness, Floral City, Lecanto, Homosassa, Hernando, Rutland Beverly Hills, Citrus Hill, Citrus Springs, Pine Ridge, Dunnellon and the surrounding areas.